Inter Milan’s slump continues again in Serie A as they stumble into a 1-0 defeat against Napoli at San Paolo stadium, giving more pressure for Claudio Ranieri as his team has now suffered seventh straight defeat in a row. Ezequiel Lavezzi kept his goal scoring form on as the Argentinian international was decisive again on the night after previously grabbing two goals for his side during the Partenopei’s victory over Chelsea in the Champions League. Playing without one of their three tenors, Marek Hamsik, Napoli were still keen on proving they can grabbed important result despite the disturbance of Champions League fixture in the midweek as the Partenopei took control of the match immediately. Walter Mazzarri’s team didn’t seem to lose Hamsik as his replacement, Blerim Dzemaili puts on a great shift in supporting Lavezzi and Edinson Cavani duo up front. Napoli created plenty of chances in the first half as Lavezzi, Cavani, Dzemaili, Zuniga all giving a tough times for Julio Cesar on the Inter’s goal along with his back line, who were forced to work as hard as ever. Fortunately for Ranieri’s team, the Partenopei players apparently didn’t wore their scoring boots on as the chances are just flying away, giving a sigh of relief for the under fire coach as his team survived the first half on onslaught. Inter tried to step up their game in the second period and looking like doing so in the first few minutes but Napoli eventually took the control again with the exquisite movement from Lavezzi-Cavani and also Dzemaili up front. After holding on for about an hour of match, the Nerazzurri’s defense finally collapsed when the Argentinian international curled in a wicked shot from the left side after receiving an excellent pass from Dzemaili. Lavezzi’s goal spurred the home team even more as they continue to storm an attack on Inter’s defense, forcing several saves and last ditch defending tackles from the visitor. Another controversial moment arrived when Hugo Campagnaro’s goal was canceled out after the referees though the player was on an offside position. Right after that incident, the Nerazzurri picked up an advantage as a defensive error made by Salvatore Aronica eventually forced him to leave the pitch after receiving a red card. 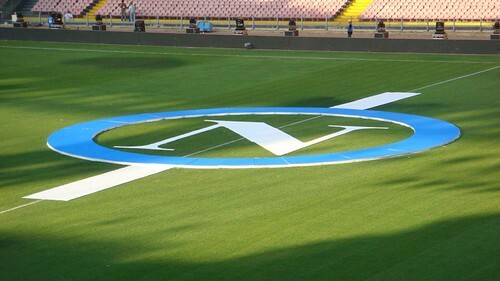 Despite playing against 10 men, Inter still found problems in breaking up Napoli’s defense as they only grabbed one golden chance from Pazzinni’s header, which didn’t reach its target. The match eventually ended with another defeat for Ranieri’s squad, providing many questions regarding the under fire tactician’s future, which could be decided in the next few days.